The Pacific Plate contains an interior hot spot forming the Hawaiian Islands. Hillis and Müller are reported to consider the Bird's Head Plate to be moving in unison with the Pacific Plate. Bird considers them to be unconnected. In the south-west, the Pacific Plate has a complex but generally convergent boundary with the Indo-Australian Plate, subducting under it north of New Zealand forming the Tonga Trench and the Kermadec Trench. The Alpine Fault marks a transform boundary between the two plates, and further south the Indo-Australian Plate subducts under the Pacific Plate forming the Puysegur Trench. The southern part of Zealandia, which is to the east of this boundary, is the plate's largest block of continental crust. The Pacific Plate has the distinction of showing one of the largest areal sections of the oldest members of seabed geology being entrenched into eastern Asian oceanic trenches. A geologic map of the Pacific Ocean seabed shows not only the geologic sequences, and associated Ring of Fire zones on the ocean's perimeters, but the various ages of the seafloor in a stairstep fashion, youngest to oldest, the oldest being consumed into the Asian oceanic trenches. The oldest member disappearing by way of the Plate Tectonics cycle is early-Cretaceous (145 to 137 million years ago). All maps of the Earth's ocean floor geology show ages younger than 145 million years, only about 1/30 of the Earth's 4.55 billion year history. ^ "SFT and the Earth's Tectonic Plates". Los Alamos National Laboratory. Retrieved 27 February 2013. ^ a b Wolfgang Frisch; Martin Meschede; Ronald C. Blakey (2 November 2010). Plate Tectonics: Continental Drift and Mountain Building. Springer Science & Business Media. pp. 11–12. ISBN 978-3-540-76504-2. ^ Hillis, R. R.; Müller, R. D. (2003). Evolution and Dynamics of the Australian Plate. Boulder, CO: Geological Society of America. p. 363. ISBN 0-8137-2372-8. 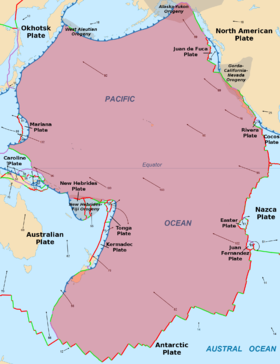 Wikimedia Commons has media related to Pacific tectonic plate.